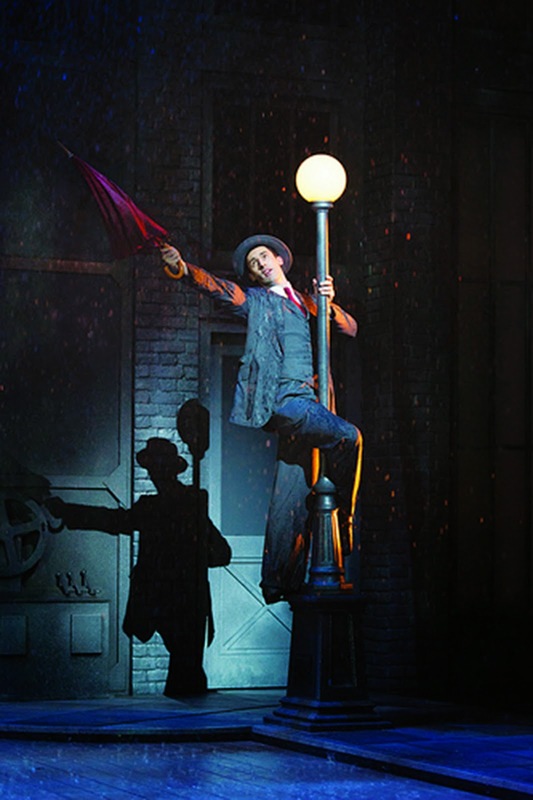 Singin’ in the Rain as a stage musical is something of an oddity on paper – a stage production of a movie musical chronicling the fictitious production of, somewhat postmodernly, the first movie musical. The original, now-iconic 1952 film, complete with beloved performances from the likes of screen legends Gene Kelly and Debbie Reynolds, as well as a myriad of instantly recognisable sequences and set pieces that have become etched in film iconography, had tremendous fun with it’s own movie-within-a-movie approach, as well as having some knowing winks and nudges to the Hollywood studio system and politics of the time (not to mention the decades preceding it). It was also a big, vibrant and showy release, nestled comfortably within the golden Hollywood era of musicals, and it’s big-budget stylings, high-profile cameos (from the like of Cyd Charisse as the sultry Broadway dancer) and much-publicised ‘dazzling technicolor’ all part of the razzmatazz and splendour. All this considered, it isn’t difficult to envisage a stage adaptation of Singin’ in the Rain losing some of its irony and knowing, not to mention having to downsize on the spectacle and scope by necessity, possibly even seeming somewhat twee by contemporary musical standards. 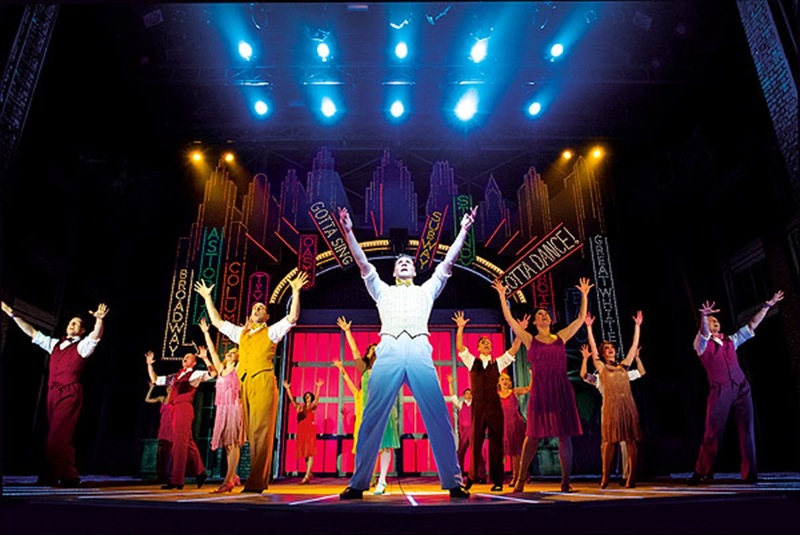 It is no small achievement or praise then to find in Singin’ in the Rain one of the most dazzling, joyous and high-quality evenings of musical theatre I have ever had the pleasure of experiencing. Before anyone starts eyeing up the hyperbole bandwagon, allow me to re-iterate with no hesitancy – this is superlative, industry-defining showmanship and entertainment bundled in with a heart-warming dose of nostalgia and a roster of recognisable, supremely enjoyable set pieces and musical numbers, all delivered by an impeccable cast and company who wholly inhabit the shows infectious, irrepressibly feel-good and celebratory tone with real pinache and verve. Set in 1920’s Hollywood(land), James Leece takes on Kelly’s lead role of Don Lockwood, celebrated movie star of the 20’s who continues to find himself linked to co-star Lina Lamont (Faye Tozer) despite his disinterest and her self-delusion and general vapid awfulness. As is par for the course with musicals of the time, Lockwood happens upon his love-to-be, aspiring actress Kathy Selden (Amy Ellen Richardson), by chance, and their blossoming romance sees them, with aid from Lockwood’s musician best friend Cosmo (Stephane Anelli) become embroiled in their studios efforts to survive the advent of the ‘talkies’ by producing the worlds first movie musical. An embittered Lamont contractually holds the legal and publicity power to ensure her continued involvement as lead, meaning the vocally gifted Selden is resigned to dubbing Lamont’s voice and singing on the new production by dint of Lina’s shrill tones being hilariously atrocious. It’s a simple but delightfully high concept tale which rejoices in its old Hollywood fittings and bursts with an exuberance and whimsy from the off. Structurally the score could easily be executed a tad stop-start, with some of the musical numbers being isolated or elongated excuses to stop and have a sing-song or tap dance, particular offenders being the likes of the tongue-twisting ‘Moses Supposes’ and even the beloved ‘Good Morning’, but it is all so darned entertaining and classily executed, and this latest production being of such an exceptional standard across-the-board that not a moment feels frivolous or wasted, and lends the entire show a tremendous sense of pace and that aforementioned celebratory, joyous tone. Often within a review I will give particular praise to the staging or costume design, or give credit for inventive or assured direction, but to go in to such minutiae here feels entirely redundant. That is not idleness or exaggeration – every element of Singin’ in the Rain radiates quality and character. 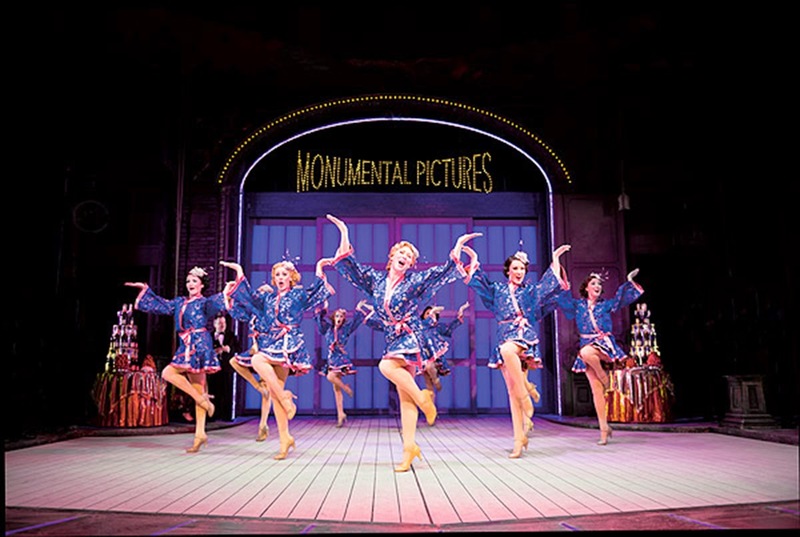 Particularly noteworthy, though, is the fact that this as a touring production is easily the equal of most West End shows in regards to its opulence and ambition – the dazzling Broadway Ballet, the films biggest extravagance, is just as magnificent and visually arresting here as it has ever been, and the staging and sophistication of such sequences as ‘Make ‘em Laugh’ and even the generally incidental ‘Beautiful Girls’ is of a standard and scope relatively unmatched in almost anything you will see on tour. 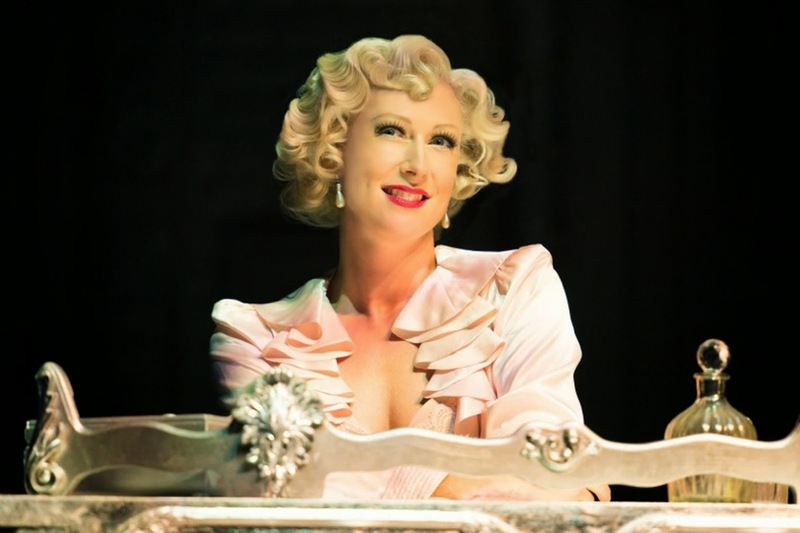 Not since Evita last year has a touring show felt as complete and aspirational as it’s West End and Broadway counterparts. Leece and Richardson do beautiful jobs as the straight leading couple, both demonstrably gifted and versatile dancers who both pull off the shows extraordinary, demanding and form-jumping choreography with seeming ease. With similarly impressive vocals to match, they lend an effortless ease to what are in fact technically two exceptionally difficult and demanding roles, and whilst Gene Kelly and Debbie Reynolds may be an insurmountable act to follow, and Leece and Richardson can’t quite recapture their magic or chemistry, they are certainly worthy ambassadors. Maxwell Caulfield and Jacqueline Clarke put in sterling support as somewhat benevolent studio head R F Simpson and Joan Rivers-esque radio host/gossip queen Dora Bailey respectively, but it is Faye Tozer as Lina and Stephane Anelli as Cosmo who frequently threaten to steal the show. Tozer, of former pop band ‘STEPS’ fame, is a hilarious treat throughout as the self-serving, ersatz Lina Lamont, who professes her own brilliance and intelligence (“What do you think I am… dumb or something?”) and actually does transpire to become a fairly duplicitous and borderline cunning adversary for our central trio. It’s a deliciously campy and theatrical role that bagged Jean Hagen a well-deserved Oscar nomination and similarly is a character that Tozer wholly, confidently makes her own and has terrific fun with, warbling through Lina’s deliberately awful solo ‘What’s Wrong With Me’ in uproarious style, and generally cementing herself as one of the absolute highlights of the show. Similarly, Anelli as Cosmo commands scenes and attention throughout, with an extraordinary physicality to his performance that not only demonstrates faultless comedic timing and bravery, but genuinely evokes the sense that someone, somehow, went back and plucked Anelli from yesteryear or at the very least could trace his ancestry back to the original Cosmo, Donald O’Connor, such is the genius and precision of his performance. 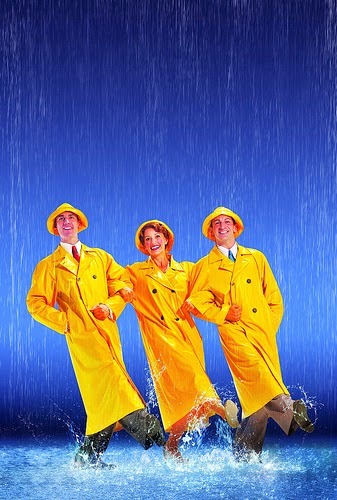 Practically every moment of Singin’ in the Rain is an exquisite, joyous celebration of everything musicals, both old and new, can and indeed should aspire to be. 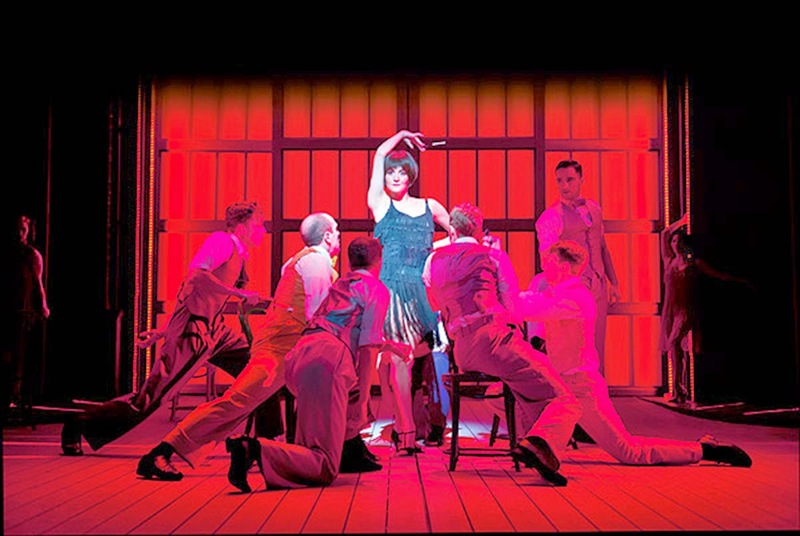 Cast aside any hesitancy you may have that this is somehow comfortable, old-fashioned fare, for this latest touring production is not only blazoned with spectacle and eye candy, but is as exciting and infectious as musical theatre can possibly get. By the time the curtain call rolls round and the entire cast take to the stage under literally thousands of litres of pouring rain, wielding multi-coloured umbrellas for a crowd-pleasing reprise of the iconic titular number, the audience have long since been won over, and even the most jaded cynic will be hard pushed to deny that they have been privy to something very special, timeless and classic indeed. If you are a fan of musical theatre, or a good evening’s entertainment as a whole, do not miss out on this opportunity to be showered with pure joy and experience one of the deservedly most beloved, and now accomplished, musicals of all time. 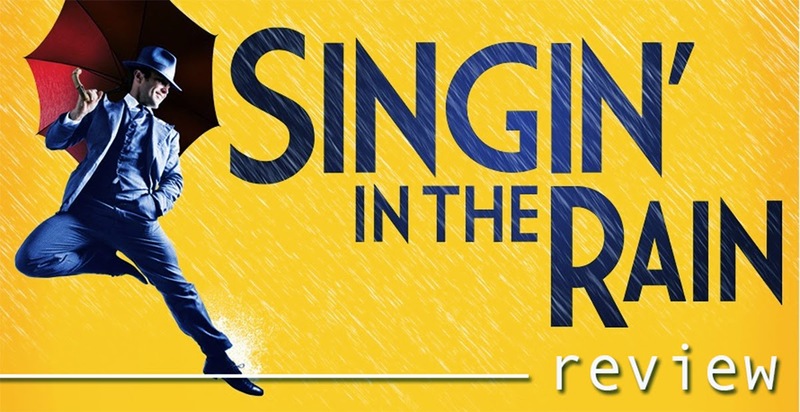 SINGIN' IN THE RAIN is running at the Birmingham Hippodrome from Tuesday 18 March to Saturday 05 April. CLICK HERE for more information on the show's run at the Hippodrome and to book your tickets! Alternatively, call Ticket Sales directly on 0844 338 5000 now to book your tickets! Press tickets for this performance of Singin' in the Rain were provided courtesy of the Birmingham Hippodrome directly. (A)musings Media gratefully acknowledges their generous invitation.